The form of arthritis known as ankylosing spondylitis affects the spine, causes back pain, and can't be cured. It can, however, be treated with exercise and medication. Ankylosing spondylitis is known to predominantly affect men. The condition's symptoms include lower back pain and stiffness. Back pain is a common complaint. Most often the cause is something like a pulled muscle or overstretched ligament, and it is short-lived. Deterioration of cartilage and disks in the spine can also lead to back problems. For a smaller number of people with back pain, the cause is ankylosing spondylitis (AS), a type of arthritis. 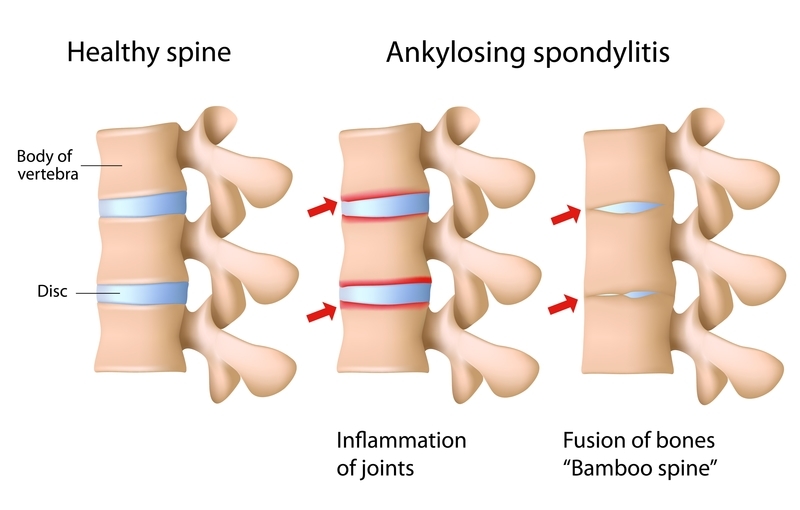 Ankylosing spondylitis causes inflammation at the joints in the spine and the joint at the bottom of the spine that connects it to the pelvis (sacroiliac joint), resulting in pain and discomfort. 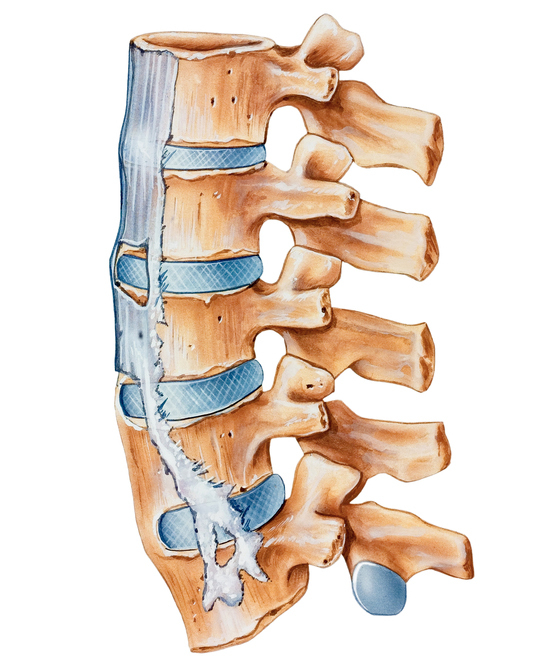 Bony bridges form over time between vertebrae in the spine; the result: loss of range of motion. Some bones, in fact, may permanently fuse together. Ankylosing spondylitis (listen to how it’s pronounced by clicking here) can’t be cured, but it can be treated and slowed down. Because some aspects of treatment differ from that of other causes of back pain, it’s critical to make a timely diagnosis. Chronic back pain lasting three months or more is the most common symptom of AS. Certain characteristics of the pain can help to distinguish it from other causes of low back pain. The pain is typically worse at night and in the morning, lasting for an hour or more. The pain of AS usually is worse at night and in the morning. Pain improves with exercise and is not relieved with rest. Symptoms usually begin before age 40. AS is treated with exercise and medications. NSAIDs relieve pain, and biologic drugs may slow down the disease. Exercising—including stretching—can ease symptoms, experts say. Other types of back pain require rest; not so with ankylosing spondylitis. The pain caused by this condition doesn’t get better with rest. Symptoms of AS usually begin before age 40, but there’s often a long lag time before diagnosis. Doctors report seeing ankylosing spondylitis patients in their 60s and 70s who are newly diagnosed, even though they’ve had symptoms for decades. It’s not known what causes AS, but genetics plays at least some role. The condition is more common in men and in Caucasians, and about 90 percent of Caucasians with AS carry a gene called HLA-B27. However, not everyone with the gene will get AS—and people without the gene can develop the condition. Therefore, other factors also contribute. Smoking, for example, can increase risk for AS. It’s not possible to predict who will get AS. But having the symptoms described above in addition to a first- or second-degree relative (parent, grandparent, sibling, aunt or uncle) with a type of arthritis in a group of conditions called spondyloarthritis—which includes AS, psoriatic arthritis, arthritis-related inflammatory bowel disease, and reactive arthritis—should prompt you to be evaluated for AS. Ankylosing spondylitis is diagnosed with a physical examination and X-rays. However, early in the disease, the X-rays may appear normal. In some cases, a magnetic resonance imaging (MRI) test may be done to look for inflammatory changes in the lower spine. Goals of treatment are to relieve pain and prevent or delay further damage to joints. Exercise, again, is important, and may be combined with medications. Biologic agents that target the underlying mechanisms that trigger inflammation can reduce pain and improve function. In addition, they have been shown in some studies to slow down the worsening of the disease. The ones approved for AS include adalimumab (Humira), infliximab (Remicade), etanercept (Enbrel), certolizumab (Cimzia), golimumab (Simponi) and secukinumab (Cosentyx). Nonsteroidal anti-inflammatory drugs (NSAIDs) also can help relieve the pain and stiffness caused by ankylosing spondylitis. adalimumab, anti inflammatory, anti inflammatory drugs, arthritis, back pain, back problems, bowel disease, cartilage, certolizumab, chronic back pain, exercise, golimumab, inflammation, inflammatory bowel, inflammatory bowel disease, low back pain, muscle, nsaids, pain, psoriatic arthritis, reactive arthritis, relieve pain, report, smoking, type of arthritis, types of back pain. I am a 50 years old female diagnosed with Rheumatoid Arthritis 2 years ago but have had symptoms for at least 20 years. I was taking methotrexate and Cymbalta, as well as infusions of Remicade, nothing worked for me. All my pain was from my waist down and certainly not something I can stand. The only treatment that has been successful has been the taking of RA herbal remedy i purchased from Best Health herbal centre. I now wake up every morning without pain. I have been pain-free period for more than 4 months. I have regular blood tests and do not experience any of the side effects from taking the herbal remedy. Thank God this works for me. I feel great!. i just find out 18 year boy, cousin, with AS, & if foods/diets can be helped. i am nutritionist, but believe in natural ways to support body reduce inflammations…etc. Inja, please see the following posts for help with inflammation. Each of them has elements of natural means to treat or prevent inflammation. I have ankylosingspondylitis. I’m not able to take any anti inflammatory medicine orally. I do take Tylenol Arthritis. I was wondering about Cymbalta?